Some 30 years ago, in 1988, I landed in Heathrow Airport outside London on a rainy night for the start of a London-France holiday. For the few days in the UK, my cousin Eddie Obrero would put me up. 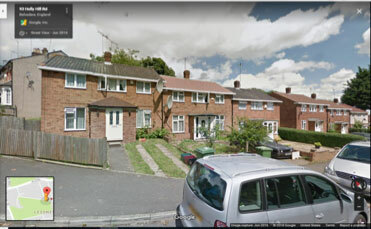 But first I had to get myself to Eddie’s place in Bexleyheath, a suburb of London. Not quite Manderlay or Northanger—not even Downton -- Abbey, but on a stormy English night it sounded very Brontësque, with all the foreboding and brooding of Heathcliff’s moors. A wet and stormy night in the British capital. Eddie was a second cousin, and I had met up with him on my previous visit to the UK two years earlier in 1986. Back in Manila in the late 1950s and through the ‘60s, I might have seen him once or twice, at our aunt’s law office where he worked as an assistant. Since those days, his family had also spread out: his mother and sisters moved to the US; his father (a merchant marine captain who had seen most of the world was separated from his mother) planted his roots in Manila; our lawyer-aunt settled in New York; and Eddie and his wife ended up in the UK. From my 1986 visit when I only stayed one night, Eddie had extracted a promise from me that on my next visit to the UK, I should spend more time with his family. He was just as homesick for blood relations as I was in visiting the chilly British Isles. So I was really just keeping my word to him in doing a return visit. The one catch to the bargain deal was that the outbound flight had to terminate in Brussels with a stopover but with no disembarkation allowed in London. Being in-between jobs then, I therefore had the time, and I really wanted to see the Loire Valley and Mont-St. Michel in France. Also, my parents were going to be on their own tour of Switzerland, so I would at least meet up with them in Paris. Thus, this cheapo TWA flight was for me, but I had to find a discreet way to extract my checked-in bag when I (prematurely) got off at London. Thus, when I checked in at the TWA counter in LAX, I charmed and distracted the check-in clerk to tag my one bag “Heathrow” only, instead of “Brussels.”If not for that — and this was way before 9/11, so none of the airlines looked at you with a fine-tooth comb -- I would probably have had to buy a short Brussels-London return flight.Anyway, my “distraction operation” succeeded, and the clerk tagged my checked-in bag with London as its final destination. Yay!One obstacle down and taken care of. So the plan was to disembark in Heathrow, claim my one piece at Baggage Claim, even though I was ticketed for Brussels. The TWA flight arrived at Heathrow, and I claimed my one suitcase without incident. The flight, if I recall, was less than half-full. But the next challenge was the weather. It was that dark and stormy night and I had to get myself to Bexleyheath. Eddie and family were expecting me that evening. I had planned to rent a car but didn’t count on such a fearsome weather. I had a flashback of the easier time I had renting a car in London from my previous visit two years earlier. In 1986, the TWA Frequent Flyer promotions were just as good. I distinctly recalled there was one offer to earn a quick 5,000 points if you rented a Hertz car on a UK holiday. So just before I flew back home (in 1986, when O.J. Simpson was still the innocent, squeaky-clean Hertz spokesman on its TV ads), I rented the cheapest Hertz car at Heathrow without even bothering to get additional insurance. · This was England, and they had everything backwards. People drove on the left-hand side of the road, but with the driver on the right-hand side of the car. · It was a miserable night. Not only would visibility be dreadful but reading street signs would be equally challenging. · There was no GPS then; all I had was the old-fashioned paper map. 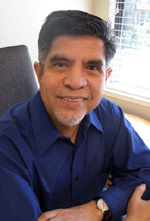 · There were no cell phones either from which to periodically check in with Eddie. Thus, I was going to “fly” blind, so to speak. I doubt that St. Christopher could’ve helped me at the time. But hey, the whole world was not going to be on the road that night, so the London roads were going to be, if not my fish-n-chips, then my oyster—a very wet oyster. I forget now what model car was rented to me that very wet night. A Morris? A Ford? I don’t think it was a Jaguar, an Aston-Martin or a Rolls. (LOL!) 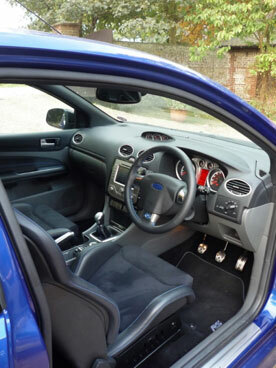 It might actually even have been a Renault, just something small and compact. And I forget whether it was an automatic or a standard (which I know how to drive). I have, however, always had an excellent sense of direction. So once I home in on the general direction, I will get myself there by the most direct route and would only be waylaid if there were some obstruction and rerouting that needed to be done. I was up to the challenge. So, my seemingly foolhardy motor trip began. I set off in the general direction of Bexleyheath—just due west of Heathrow, cutting through the southern suburbs of Greater London. How a Google map today would guide you (my alterations). From the map above, I believe I drove the more direct route: via surface streets taking me close to the 1 hour, 22-minute timing recommended there. For the more direct route, I just drove east. I quickly became acquainted with this other uniquely English thing called the “round-about” or what we call the “circle” outside the UK. I didn’t even bother turning on the car radio, just so I could concentrate fully on the wet roads and my windshield being pelted by the rain. And I am also proud to say, that I think I only stopped at two petrol stations along the way just to confirm that I was indeed headed the right way. My instincts didn’t fail me. 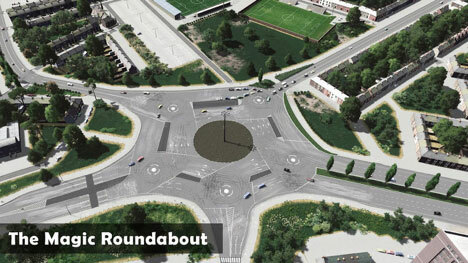 Typical British roundabout; except picture driving around this at night. So after about 1 hour, 20 minutes – only 15 minutes more than the estimated time the car rental desk said it might take me -- I arrived promptly in front of Eddie’s door at 93 Holly Hill Road in Belvedere, Bexleyheath, safe and sound, wet and a little frazzled. It was good to see a familiar face and best of all, they had a bowl of hot soup waiting for me. Cousin Eddie and his family lived in the second flat from the left. Cousin Eddie’s wife, Nelia, worked as a nurse at the famed Great Ormond Street Hospital for Children of London (GOSH) then. The only reason the GOSH connection rang a bell for me was that GOSH is the main trustee and guardian of author Sir James Barrie’s most successful property, Peter Pan, the beloved children’s story. It is the main beneficiary of all royalties made by any publications and productions of Peter Pan; thus, so long as children keep reading and believing in Peter Pan, GOSH will be treating sick children in perpetuity. Great Ormond Street Hospital for Children of London, where Eddie’s wife, Nelia worked as a nurse at the time. A few years later, the English Obreros also moved to the USA. And then, 24 years later, at the Opening Ceremony of the London 2012 Olympics, GOSH featured prominently in the National Health Service number. GOSH at the London 2012 Olympics Opening Ceremony. The big National Health Service / Children’s Nightmare segment paid tribute to GOSH. The portion included some of the best-known characters in English children’s literature: Captain Hook (Peter Pan’s nemesis), forty (40) Mary Poppins’ coming to the rescue, and a giant Voldemort (from the Harry Potter series). Nelia, unfortunately, was no longer with GOSH by 2012. In 1992; Eddie had already moved his family to the US. Another vignette of that trip, which seemed insignificant at the time but had some resonance for me, was when I got on the next flight to Paris—and I remember it distinctly—I volunteered to turn in my small paring knife (which I carried on my person whenever I traveled to Europe to use with fruits I bought from the local markets) to the cabin crew before boarding. The crew were so grateful at the voluntary gesture, I obviously made a good impression on them. Of course, 13 years later, on 9/11/2001, our whole world and how we fly changed, and thinking back on that little gesture brought a shudder. Some of the hijackers of 9/11 brought their box-cutter on board to use as weapons. I was handed back my knife with a smile on disembarking. For the few days, I was in London that year, I saw the British stage production of Stephen Sondheim’s “Follies,” with Dame Diana Rigg being the most prominent name in the cast. Also the absolutely bizarre “Starlight Express” of Andrew Lloyd Webber wherein all the actors, portraying various trains, were on roller skates and spent the whole evening chasing each other around a derby track encircling the whole orchestra level. Needless to say, you almost got whiplash following the actor-trains zipping around you, without being in an actual accident, whereas the entire show felt like one. Then it was off to France to see Mont St. Michael, then meet up with Mom and Dad in Paris where I treated them to dinner at the La Belle France restaurant of the Eiffel Tower. We then watched the Bastille Day fireworks together apres dîner. Next year, the iconic, old TWA Terminal at JFK, designed by Aaro Saarinen, will become a 512-room destination hotel for old airline buffs. I will try to spend even one night there for old times sakes. The old TWA terminal at JFK, with two new wings being built where the hotel rooms would be located. Life-lesson learned from that trip: if I can drive some 30 miles on the left-side British roads, on a dismal, stormy night without the aid of a GPS or cell-phone, and get to my destination in one piece, I can do anything I set my heart to. You should try it sometime.